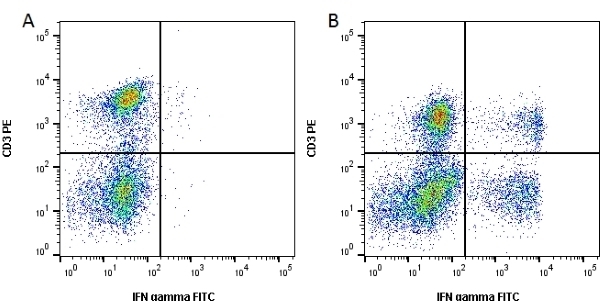 Figure A. RPE conjugated mouse anti human CD3 (MCA2184PE) and FITC conjugated mouse anti human IFN-gamma (MCA1581F) on unstimulated human lymphocytes. Figure B. RPE conjugated mouse anti human CD3 (MCA2184PE) and FITC conjugated mouse anti human IFN-gamma (MCA1581F) on human lymphocytes stimulated with PMA and ionomycin for 5 hours in the presence of brefeldin A (BUF075). Data acquired on the ZE5™ Cell Analyzer. Brefeldin A Solution (1000x) is commonly used to enhance intracellular cytokine staining by inhibiting protein transport. This solution causes many of the cytokines to accumulate in the Golgi apparatus and endoplasmic reticulum. Note: Aliquot product to avoid repeat freeze-thawing. Time and culture conditions may need to be optimized.